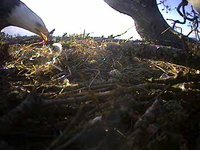 The response to our request that videos and pictures from the live eagle nest streaming be posted to our site here has been truly impressive; so much so that we are having to move up our schedule for giving this facility its own topic and getting things set up to help you and all the others who are coming to the site. This section is the start of the focus site for the captures and edits that you, the adoring eagle-watching public, have chosen and created. Here you are offered the opportunity to create more than just albums. Here you can create your story and illustrate it from your albums. Here we will also honor those who go above and beyond the mere capture of video or stills to create something different, more, and better. If you have been directed here because you have posted our content some other place, please read the page on copyright and why it matters to the eagles. We live in a new era of creativity. It is not just that we now have digital cameras, high-resolution video, huge ability to store all manner of visual and auditory content, ability to create computer-generated graphics, etc. ; it is that we also have the means to make 100% copies of the works of others and whether purposely or inadvertently, turn them to our own use. I've grown up with and made a business of the digital and internet revolution. I've been a part of its growth, and been involved in many of the controversies and discussions about its effects on society in general and artists, writers, photographers, and musicians in particular. Here at Hancock Wildlife Foundation we are experiencing some of the same problems I've dealt with in other venues, and I think we need to examine what we're doing and understand the consequences - and fix the problem before it becomes a real issue. We ask that any remaining copyrighted imagery posted to any site other than Hancock Wildlife be removed from those sites immediately. As you all probably know, the success of the eagle nest streaming video took us by surprise - and kept us hopping full time for the past 6 months just trying to keep up with the things that you and the rest of the world wanted to know. As the nest season is winding down, we've been catching up on all the various projects that we've had on the back burner - mostly for want of time and people to do them. One of these is getting our systems set up so that you can share your favourite moments that you've caught from the live stream without putting them up on any of the various commercial video sites that don't pay us anything at all. You can post them to our Photo Gallery area now. Note: you must make sure the file names you are uploading don't have special characters in them like spaces. We're hosting this on a system that seems not to like that. As you may notice, I've created a non-admin account for myself (rick-pitt) and used it to make sure that the member album setup is working. I just used the "JUPLOAD" option from the "Options" drop-down menu to upload 100 pictures in one go - worked like a charm. The software also shows the "EXIF" information from inside the pictures so you can see what the settings were when the picture was taken. As soon as we get the new Hancock Wildlife TV web site up, we'll be moving the albums over to it. Please comment here on your experiences with this new software.